A new mobile site rewrite for Category5 Technology TV will soon be gracing your smartphone and tablet! @Category5TV is there a problem with http://t.co/XKzPd5HYIZ site as I can’t open/expand any of the menus using my Blackberry Curve browser? Well, that’s kind of annoying for BlackBerry users, isn’t it? I had a good close look at the mobile site back-end, and man-oh-man, it’s getting old. I think as a developer, it’s hard not to want to go back and rewrite everything you’ve created about once per year. That’s how fast the technologies change it seems, and the way I was coding a year ago is much different from the way I code now. The current (old) mobile site uses flat-file delivery powered by a database backend. Your mobile device must preload all textual resources, and then it loads the images and videos when you navigate around. But the architecture forced me to hold back some features at the time. 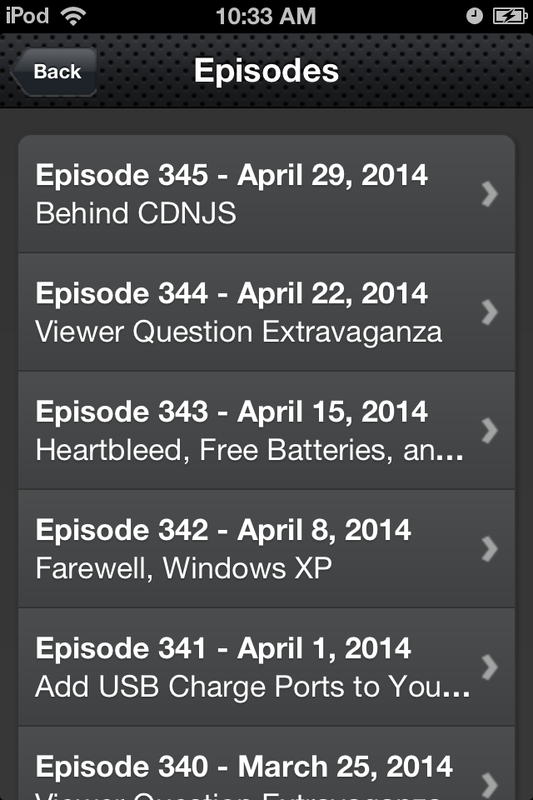 The episode list on our mobile site version 3.1 contains the most recent 53 episodes. For example, the mobile site (versions 1-3) have always been restricted to the past year’s worth of videos. That’s all that was practical since your device would have to preload all the text for each episode. Loading all 7 seasons was not possible because it would just take way too long to load, and it’s already much too slow for my liking. I also had to restrict the amount of images and overall weight of the mobile site since many assets were preloaded at launch. Preloading 53 videos is horrible for performance, and this is not a well optimized way to do things. So, all that said, Tony’s message and my review of the code drove me to want to redesign the mobile site infrastructure and front-end from the ground up. There are a few things that come into play, but the big one is that I recently developed the entire infrastructure to bring Category5 to the Roku platform. So I am able to tap into new, optimized database functions that didn’t exist even 3 months ago. Features such as separation of episodes by season, and having access to our entire library of videos, including our “Special Features” category which was introduced specifically for Roku, but now can be migrated to other platforms such as our mobile site. Out the gate though, a rewrite means implementing greatly improved programming techniques such as AJAX data loading on the mobile platform… so I can rewrite the code so each episode’s text only loads after you click on it. I’ll also stop all these videos from preloading. All this means is that we can offer a million videos if we want, and the site will still load just as quickly as if there were only 5 videos. The ability to load data through AJAX has existed for a long time, but my skill-set has grown with regards to its implementation, so I am now capable of much more than I was a year ago. 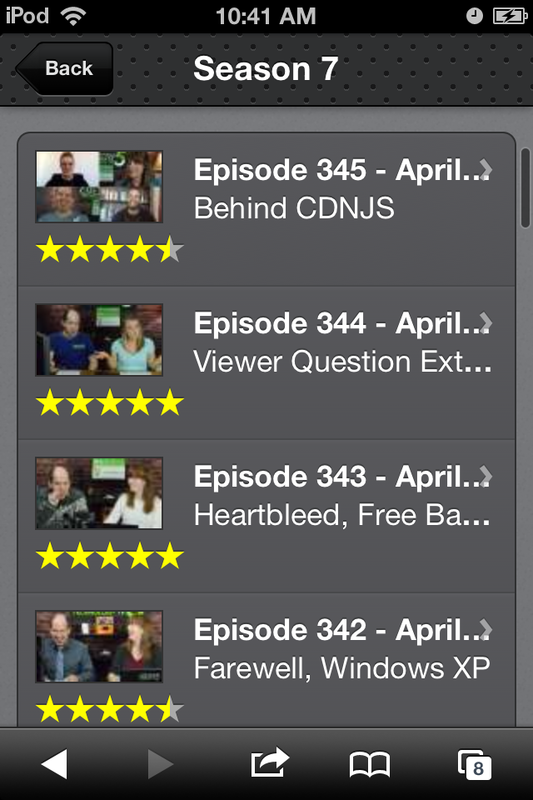 The greatly improved episode list on version 4β of our mobile site features all available episodes (345 at the time of writing). The biggest and most exciting thing to me about this change in programming style is that I can include all episodes in the mobile site. Not just the past year’s worth. It also opens us up to eventually including other features, such as the aforementioned “Special Features”. Do more with less. That’s what version 4 represents. Photo gallery re-write with grid-style gallery layouts. Season 2 Episodes made available on-demand and in RSS feeds. Season 1 Episodes made available on-demand and in RSS feeds. Replace the main menu script with something more robust, to accommodate the growing list of menu items and introduce third-level navigation. – Done, sortof. Rather than replacing the menu, I recoded bits of the existing one to add new functionality. I think it works quite nicely. Replace the jQuery scroller at the top of the home page with something a little more current. – Done, sortof. I decided that for the moment, I still like the scroller we have, and it’s lightweight, which is a plus. So instead I just improved it slightly. Buttons have been changed to our orange color to make them stand out more, too. I have begun coding a new “animated” version to replace this one eventually, but for now I’ve bought some time. Make the giant header slideshow on season pages select a handful of random images from the season rather than the most recent ones. 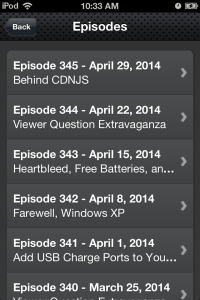 Related Episodes feature on show notes pages. Now you can see what was said in the chat room in realtime while watching on-demand video from Category5 TV. Beginning with Episode 231 (February 21, 2012) we have been keeping a log of the Category5 TV chat room during the live broadcast, complete with timestamps. These logs have been available to view for a while now via the show notes page for each episode since that time, but I’ve always wanted to take it a step further. Effective immediately, logged-in registered viewers may enable the chat logs as their source for closed captioning. This is a two-fold success. First, it adds a pretty neat feature to the on-demand video since logged-in viewers can now see what was said at the time during the live show, overlayed on the video, but secondly, it allowed me to generate an effective closed captioning system on our web site. I hope to eventually offer English (and electronic translations to other languages) captions, and this provides the back-end technology to do this. To enable this feature on your account, login to Category5.TV and visit your profile page. Once their select “Chat Logs” as your source for closed captioning. Make sure you’re logged in, as this is an exclusive feature to registered viewers. Please offer your feedback below. What do you think of this feature? Why am I so excited about this “transcoder” thing? There’s something I’ve been really excited about the past little while, and some may not understand why. It’s the new Category5 Transcoders. Provide screaming fast file delivery via RSS or direct download. Provide instant video loading in browser embeds, with instant playback when seeking to specific points in the timeline. Provide Flash fallback for users with terrible, terrible systems. Ensure our show is accessible across all devices, all platforms, and in all nations. Make back-episodes available, even ones which are no longer available through any other means. Reduce the file size of each version of each episode in order to keep costs down for us as well as improve performance for our viewers. Ensure our video may be distributed by web site embeds, popup windows, RSS feed aggregators, iTunes, Miro Internet TV, Roku, and more. Ensure our videos are compatible with current monetization platforms such as Google AdSense for Video. Both Blip and YouTube services are blocked in Mainland China, meaning our viewers there have trouble tuning in. 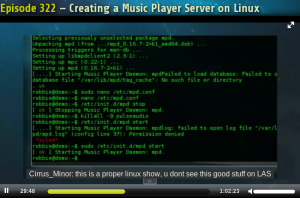 Both services, in their default state, require manually labour in order to place episodes online in a clean way (eg., including appropriate title, description and playlist integration). Blip does not monetize well. YouTube monetizes well on their site, but they restrict advertising on embeds (so if people watch the show through our site rather than directly on YouTube, we don’t get paid). The process of transcoding the files and making them available to our viewers has been a onerous task since the get-go. We grew so quickly during Season 1 that we didn’t really have the infrastructure to provide the massive amount of video that was to go out each month. We had one month in 2012 for example, where we served nearly 125 Terribytes of video. It takes me many hours each week just to make the files available to our viewers, and the new transcoder has been developed to cut that task down to only a few minutes, while simultaneously pumping out the video much, much faster. The new transcoder not only does things faster: it does things simultaneously. While transcoding the files for the RSS feeds, it has already placed a web-embedded copy of the show on our web site, in as little as 45 minutes. Not only that, but once it’s all said and done, the transcoder server then automatically uploads the file to Blip. The new transcoder consists of two servers at two different locations sharing the task itself, and then the files are distributed through two of our CDNs (one which is powered by Amazon, the other is our own affordable solution based on the old “alt” feed model). We have been working with the team at Flowplayer, who are soon to introduce a public transcoding and hosting / distribution service for content providers. With this new relationship, we will be able to serve up ads in a friendly way to help offset distribution costs. 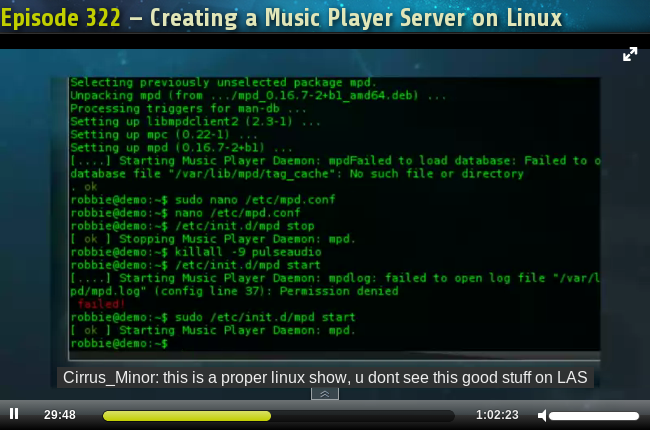 This also means we now have our own embed player, no longer relying on YouTube or Blip’s embedded player. This means, viewers in Mainland China can now watch Category5 directly through our main web site. No more workarounds! As long as we can offset the added expense of self-hosting video, this could lead to some great things. I’ll be keeping an eye on it over the next while, and encourage you to submit your feedback. I love the idea of Category5 finally being accessible to everyone, everywhere, and very quickly following each show. I also love that my Tuesday nights will no longer be so arduously long. Transcoders are a very difficult thing to explain, and the way we’re doing it is hard to explain, but to me, it’s exciting. Just know that it means “everything is better than ever”, with fast video load time through our site, RSS feeds that are more than 10x faster than before, global access (even in Mainland China), and room to grow. I’m currently running the system through countless tests, but the transcoders are live. It will be working its way (automatically) through back-episodes, so you’ll start to see the YouTube player disappearing from the site, replaced with our own player. Eventually, all 312+ episodes will be available. RSS feeds have been migrated! As per my last post, our video and audio RSS feeds have been migrated to our [formerly known as] alternate servers. The alternate servers were originally built to allow viewers in Mainland China to view Category5 Technology TV. They were the “alternate” servers because Blip.TV and YouTube are blocked in Mainland China. However, through my tests, I discovered that these servers were in fact substantially faster than pulling video from Blip.TV, so I wrote a migration script to automatically merge all files to the alternate servers upon their release, and deploy them via our RSS feeds. This means you’ll now receive our files faster (even fast enough to stream to your browser directly). It also means our files are now available everywhere, including Mainland China, directly from our main feeds. But it means we generate $0 ad revenue from our feeds. GASP! The next step is to allow China viewers an opportunity to disable YouTube on our main web site, and embed a streaming player which utilizes our new servers’ files. Again, the catch 22 in doing this is simple: YouTube helps pay the bills. The changes mean we’re incurring more cost, but adding the possibility to generate less ad revenue. It’s completely backwards to anyone trying to make money. Fortunately for you, my goal is to make our service as good as possible, and I believe with all my heart that viewers and advertisers will choose to support us. Watch for an announcement soon–you could be part of our ad sales team and even make yourself some extra cash monies while supporting the show you love! Enjoy the new feeds! If you have means to do so, please considering donating, or subscribing to a monthly donation amount. You can do so at cat5.tv/c. Create links to specific points in any Category5 TV episode. The new Timestamp feature allows you to start each episode at any point in the video. Do you run a blog and want to link to specific portions of a Category5 Technology TV episode? Or just want to share a specific clip with your family or friends? 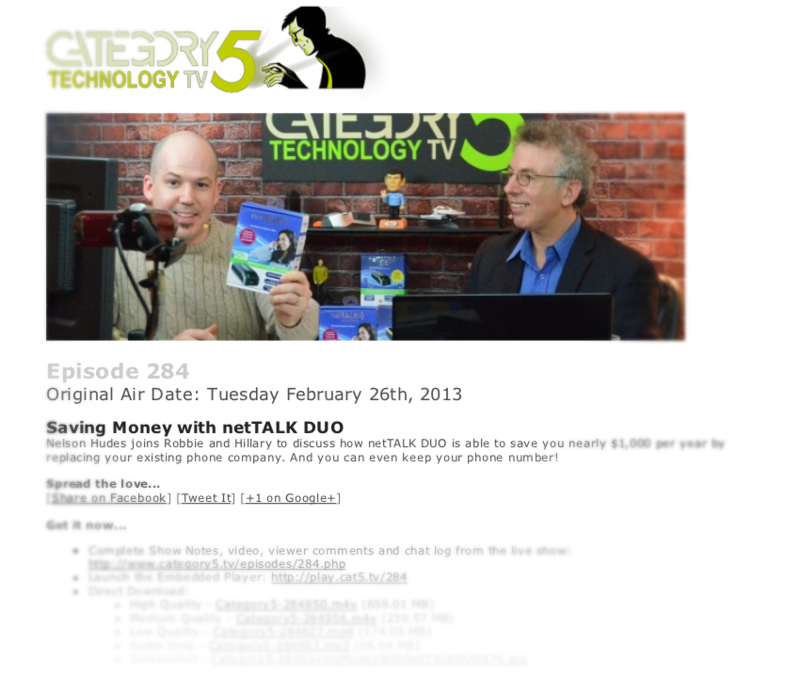 Receive full Category5 Technology TV weekly episodes by email for free. Now, you can receive Category5.TV’s weekly episodes by email! Receive Category5.TV episodes by email. This is really exciting because it means you can receive this really cool (and non-spammy) reminder each week once an episode is available. It’s not a dumb notice, or a “click here for our web site”. It’s literally an email that gives you 1) a screenshot from the episode, 2) a description of what we did in the episode (the main topic), 3) direct links to download the episode for free and 4) a handy “play now” link which will open a player window and instantly begin streaming the show to your device. 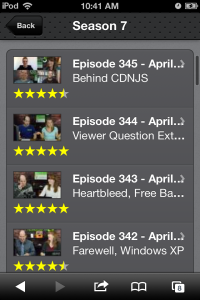 To activate this awesome feature on your free account, simply login at Category5.TV and choose “Members” -> “My Profile”, and you’ll see the new option “Weekly episode by email” as per the above image. Check it off and press Save Settings. Don’t worry, you can turn it off at any time, and we never spam you (it’s against our beliefs as non-spammers)! Don’t have an account? No worries; it’s free, and easy! Just visit http://register.category5.tv/ and sign up today. Please activate the feature, and once you’ve received your mailout (comes out when each episode becomes available; usually Wednesday mornings), let me know what you think. I would love to hear your comments below. Thanks for watching Category5 Technology TV! Thanks also to _Jot_ for assisting me with the beta testing.